Players implore LucasArts and SOE to make the game free-to-play, rather than shut it down for good. Following the announcement that Sony Online Entertainment and LucasArts were pulling the plug on Star Wars Galaxies, some of its players have started a petition asking reconsider their decision. SWG launched in 2003, and has had a turbulent history ever since, with player numbers reportedly falling to just a few thousand. 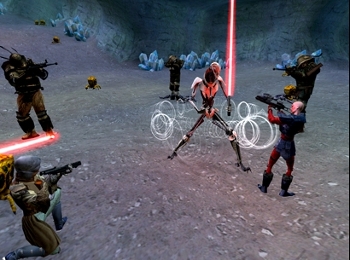 The petition, which at time of writing had amassed more than 2,500 signatures, offers a number of solutions on how SWG might be saved, including making it a free-to-play game, monetizing the trading card game, and consolidating servers with free transfers. The petition acknowledges that there's another Star Wars MMO in the works - in the form of BioWare's The Old Republic - but says that the two can co-exist, especially as SWG is set closer to the movies, and thus represents a much more familiar Star Wars experience. Taking the game F2P might not be such a bad idea: Many developers have found that MMOs are much more profitable under the F2P model. While SWG's player base may be small, going F2P could give it the boost it needs to get it going again. Unfortunately, while the petitioners might think that Star Wars Galaxies and The Old Republic can co-exist, LucasArts will probably be a lot less keen. It's going to be tough enough for The Old Republic to compete against the likes of World of Warcraft, without having to contend with another Star Wars MMO as well.